The Eigg Shed is kept cosy with its own wood burning stove. The bathroom and kitchen are in a building just behind the Shed. The outside decking and dining area at the front of the Amazing Shed. Kitchen, with fridge and full size cooker, has all the pots, pans and other equipment you need to cook. Bathroom with shower and compost toilet. Warm, light and beautifully designed, our Amazing Eigg Shed is a great place to relax and switch off from the hustle and bustle of mainland life. 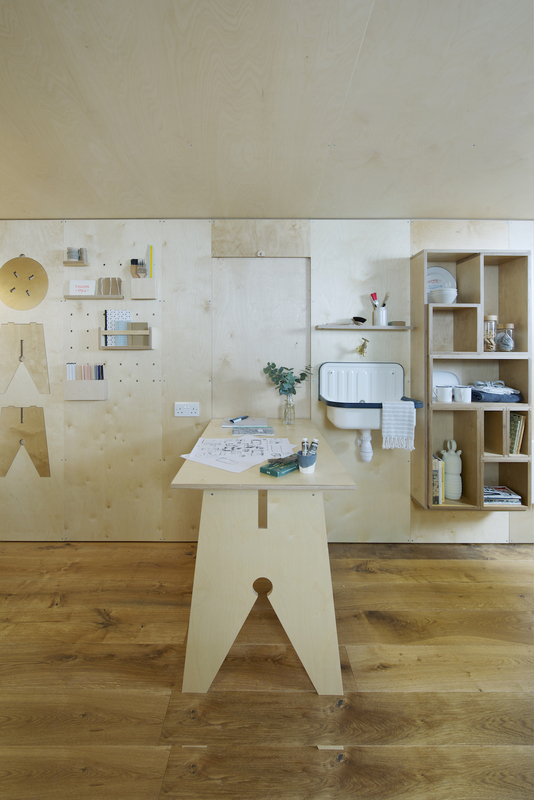 Designed by Studio Hardie, the shed is equipped to a high standard with some very clever ideas to add to your comfort. It's great for romantic couples, small families, or good friends looking for simple relaxed accommodation. The Eigg Shed has a Hobbit wood burner, a comfortable double bed settee with the option of travel cot and fold away bed. Eigg is small enough to be able to walk most places. Although you can't bring your car, you can bring bikes on the ferry, or hire them from Eigg Adventures. The Eigg Shed is conveniently located for the ferry pier and shop and the price is £75 per night. The price includes being picked up from the ferry on arrival and taking you back at the end of your holiday.